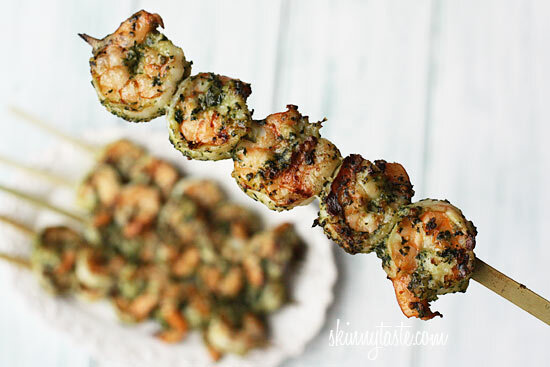 These easy Grilled Pesto Shrimp Skewers are made with homemade basil pesto, you’ll want to make them all summer long! Serve these for dinner for a light, healthy meal or make them at your next BBQ with Grilled Flank Steak, Broccoli and Orzo, Grilled Corn Feta Salad, to name a few summer favorites! 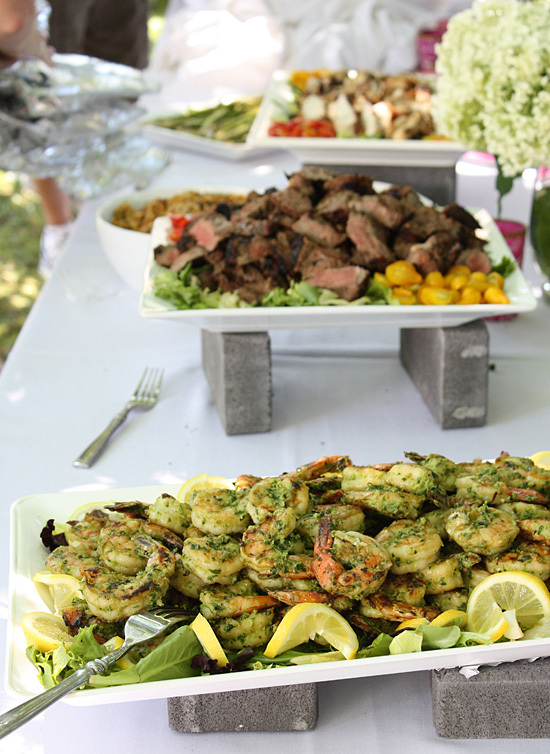 Inspired by a dish served at my sister in laws garden baby shower (pictured below), this is so simple and delicious, I knew I had to make them myself. They served them on a platter over a bed of greens, but this is also great served as skewers so you can hold them in your hand. I often keep the nuts out of my pesto to keep the fat content down and everyone always loves it. And bonus, these are low-carb, gluten-free and delicious! Note: Keep in mind that when you remove the shell from the shrimp it will weigh less, so I started with about 2 lbs of shrimp to get 1 1/2 lbs after I peel them. Depending on the size of your shrimp you will get different amounts. 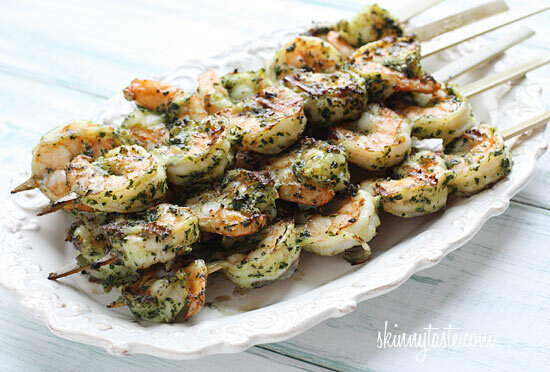 Homemade pesto with basil from my garden makes a scrumptious addition to shrimp. 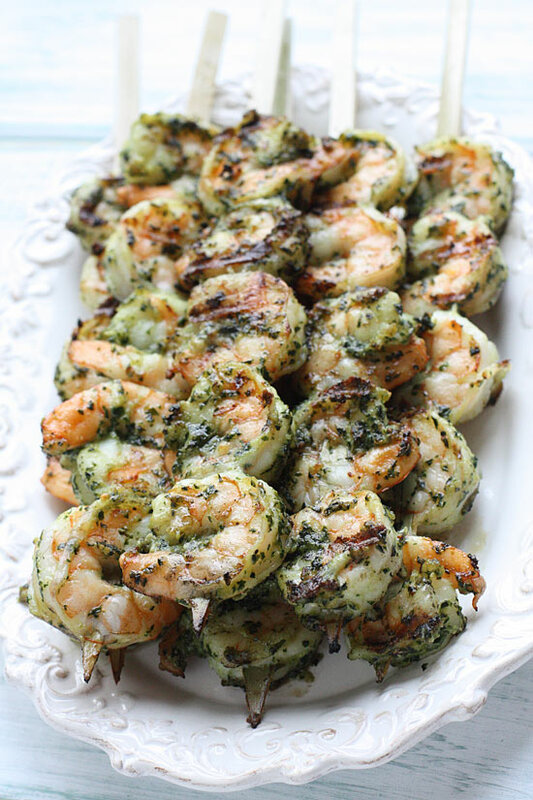 Serve these for dinner or make them at your next BBQ! In a food processor pulse basil, garlic, parmesan cheese, salt and pepper until smooth. Slowly add the olive oil while pulsing. Heat an outdoor grill or indoor grill pan over medium-low heat until hot. Be sure the grates are clean and spray lightly with oil. 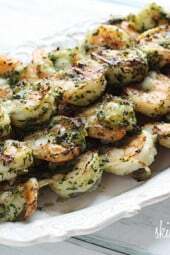 Place the shrimp on the hot grill and cook until shrimp turns pink on the bottom, about 3-4 minutes; turn and continue cooking until shrimp is opaque and cooked through, about 3-4 minutes.